Volunteer Ministers work alongside other humanitarian organizations to assist the victims of flooding after storms pummeled Louisiana. 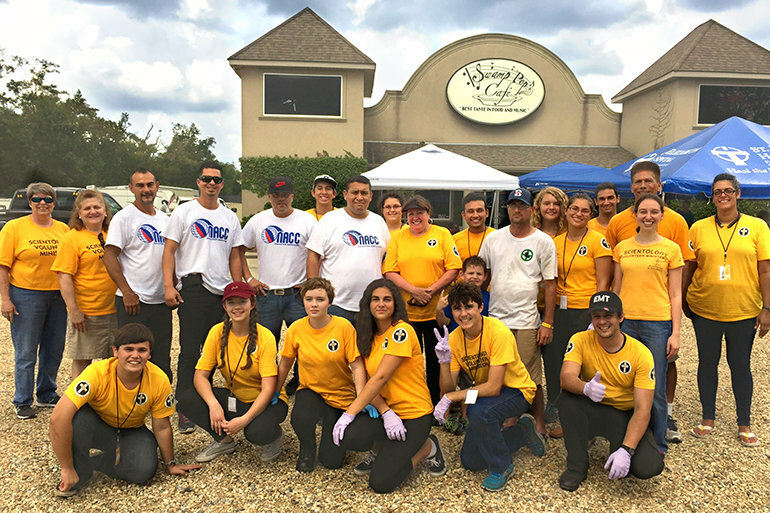 As storms pummeled Louisiana, the Scientology Volunteer Ministers Disaster Response Team arrived and continues today working with other volunteer groups to help local residents get back on their feet. Some Volunteer Ministers (VMs) are organizing and distributing supplies in a local shelter. Others are helping salvage belongings and cleaning mud and debris out of homes. Still others are delivering assists to address trauma, injury and stress. VMs are also helping alongside the National Guard along with volunteers from the Red Cross, Louisiana University, the Cajun Army, the Cajun Green Cross and many other different groups and churches. Cathy, a volunteer from Baton Rouge, has never seen anything like these floods, which damaged or destroyed some 60,000 homes, where 20,000 people had to be rescued. More than a million responded to Katrina, but on CNN’s State of the Union, Louisiana Gov. John Bel Edwards said this disaster has received less attention because it wasn’t a hurricane or named storm. To date, Volunteer Ministers have helped more than 9,500 people in Louisiana, not only ensuring they have the basic essentials of life, but that spiritually they recover from the devastation and loss brought by floods.